This workshop will explore programmatic methods for searching and accessing NASA data using Python scripting. MAST will participate, along with other NASA archives, in a workshop discussing methods for archive searching and data retrieval via Python at the upcoming 231st meeting of the American Astronomical Society in Washington, DC. 'Using Python to Search NASA's Astrophysics Archives' will occur on Sunday, January 7 at 10am, and will also include representatives from the High Energy Astrophysics Science Archive Research Center (HEASARC), the Infrared Science Archive (IRSA), and the NASA/IPAC Extragalactic Database (NED). Meeting registration is currently open. For more information, please see the AAS workshops page, and for some background information on MAST's current programmatic capabilities, see the MAST Mashup API documentation. Additional questions can be directed to archive@stsci.edu. MAST has been participating as an American Astronomical Society exhibitor for several years now. 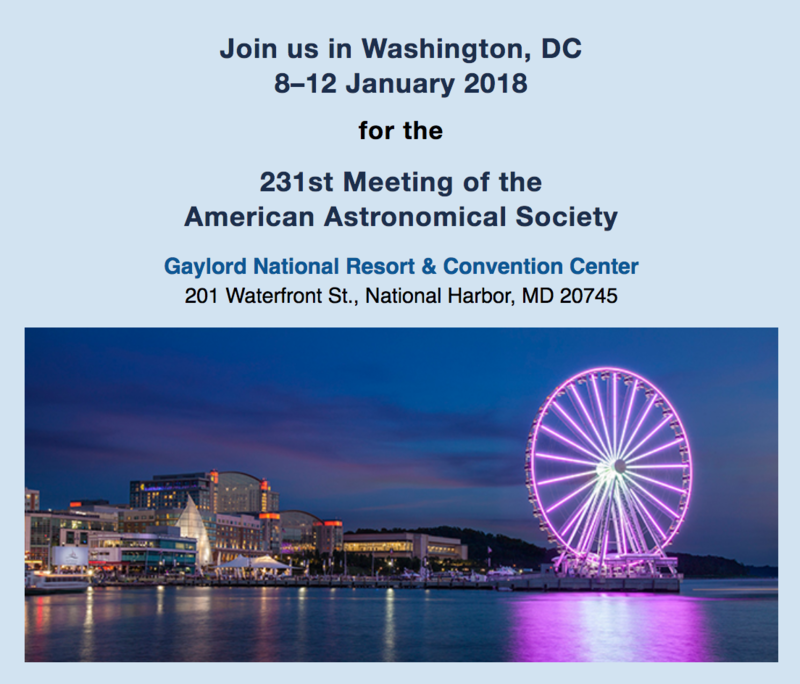 You will find us again at the MAST table in the STScI booth at the upcoming AAS 2018 Winter meeting in Washington, DC from January 8-12. Our main focus for attendance is to educate the astronomical community on the MAST archive, its data holdings, and search interfaces. We accomplish this mostly by giving live demonstrations on how to use our interfaces to search, analyze, and download data. In recent years we have also been showcasing our MAST Discovery Portal and we will be demonstrating several new features of the Portal. Our offerings are not solely interface focused however; we also have updated materials on new data products and the archive in general. AAS provides a unique meeting setting, as in the past there have been a variety of people visiting our table. We meet undergraduate students just starting out in astronomy who are interested in all of the ways we search data. We also get all levels of educational professionals coming to the booth, where we provide them with resources and teaching ideas for the classroom. And, of course, we meet with seasoned astronomers who have specific questions about their particular research projects. Interacting with AAS attendees at the booth has been a great opportunity to meet our community, and we hope you will visit us if you are attending the AAS this winter or at future meetings! Additional questions regarding MAST's AAS meeting presence can be directed to archive@stsci.edu. A number of STScI staff members participated in this year's ADASS conference in Santiago, Chile, giving a variety of talks and MAST demonstrations. This October the annual Astronomical Data Analysis Software and Systems (ADASS) conference was held in Santiago, Chile. ADASS is an annual gathering, bringing together people from around the world who write software for astronomical data processing and analysis to share ideas and progress, make connections, and bring new ideas back to their home institutions. Nineteen software developers and astronomers from STScI (four from MAST) attended ADASS this year, presenting three talks, ten posters, and one demo table. Topics presented by STScI participants were wide-ranging with Erik Tollerud giving an invited talk about Community-Oriented Programming and Astropy, Clara Brasseur presenting the new MAST service in Astroquery, and Josh Peek speaking about Neural Nets in Astronomy. Many of the STScI posters related to work done on the JWST pipeline and archive integration, including calibration validation, product generation, and instrument keywords. Other STScI posters related to ongoing work with Hubble data, particularly processing imagery from its WFC3 camera. Additionally, Tom Donaldson ran the MAST Demo Booth where conference attendees stopped by to see demonstrations of new Discovery Portal and API features, and to discuss a variety of other archive-related topics. In addition to the traditional talk line-up, breakout sessions were held with the conference split into two or three tracks to discuss particular issues or see products demonstrated in more detail. In one of these demonstrations ESASky 2.0 was unveiled, the latest version of ESA’s discovery portal. In the Astronomical Data Representation Formats discussion session, with an unprecedented level of agreement, a recommendation was reached that the FITS file format standard should remain unchanged, and that the HIERARCH convention for extended keyword names be adopted formally. Presented posters and talk slides should be available in the near future from the participants page on the ADASS 2017 website. The talks were also livestreamed and are currently available on YouTube.